Next up in The 2018 PopCult Gift Guide is a great gift for fans of golden age comics and proud Navy Vets alike. It’s another great archeological comics presentation from historian, Craig Yoe, The Best of Don Winslow of the Navy. 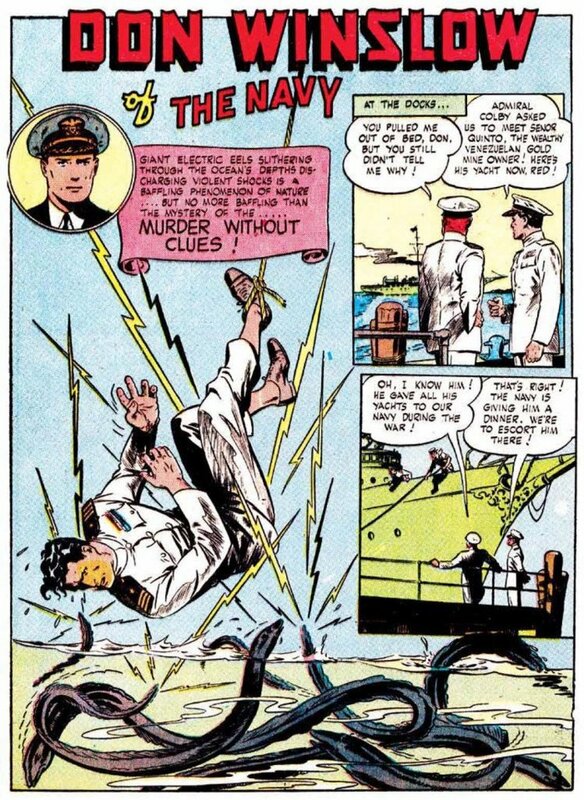 Don Winslow of the Navy originated as a comic strip, but crossed mediums into movie serials and radio shows, before landing in the pages of Fawcett Comics (the home of the original Captain Marvel) in 1943. This book is a collection of the best stories from the Fawcett Comics run of Don Winslow of the Navy, which became one of the most popular comic books running during and after World War II. Edited by Craig Yoe, the selected stories are digitally remastered and contextualized with Yoe’s historical research. Preceding the full, colorful tales is a detailed introduction on the creation of the adventurous Don Winslow, including the context for some of the racially and culturally insensitive material in the original comics. This was during wartime, and those were different times. The easily offended might not be the best target audience for this book. For fans of rollicking adventure comics, this is fun stuff. Don Winslow served to foster recruitment and entertain Navy personnel and the general public alike during World War II and beyond. Winslow fights the Axis and supervillains like The Snake and the attractive, but deadly, Singapore Sal. Don Winslow of the Navy presents twenty top-notch comic book stories from the peak days of comic book readership, and it also works as a great cultural artifact. You ought to be able to order The Best of Don Winslow of the Navy: A Collection of High-Seas Stories from Comics’ Most Daring Sailor from any bookseller by using the ISBN code, or save a few bucks by visiting Amazon.